"The most powerful shield. Small, but effective." Chest at the World Terminus. The Mighty Shield is a shield that can be wielded by Goofy in Kingdom Hearts Final Mix. The Mighty Shield resembles a large pinball bumper. It is circular, conical, and black and sky blue. 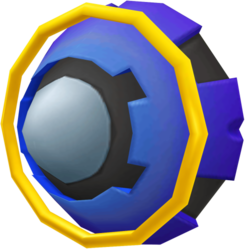 The front of the shield is blue-white and a large, yellow ring floats around the face of the shield, but is not physically attached to the shield. This page was last edited on 5 April 2019, at 13:17.